So when it comes to Pore Primers, Preppers and Minimisers it seems as though good ole Benefit were first to the game with the Benefit Porefessional. With many other brands getting excited at the prospect of gaining some what a proportion of Benefit's success by launching their own Pore Minimiser / Refiner / "goodbye waver" - who would turn it down... right? Dr Brandt's Pores No More formula suggests so. On my last few edit's of the Birchbox, I've received both these beauties and thoughts why not compare? Now these are definitely the more 'mousse-y' 'tinted' option of the group, definitely non-silicone based for the record. Both are best applied by getting a pea sized amount, dotting it on your mono brow area (which hopefully you'll have fully got rid of in a way, shape or form), around the nose area and chin. Then using gentle 'swiping' motions (not circular otherwise they may turn into little balls and run off your face... I've been there trust me). This will just have your skin feeling way smoother and your foundation and all the other bits and bobs will apply 923903285098235 times better than without. I've never really been into priming the skin up until about a year ago, and take my word for it... it makes a huge difference, period. For a more silicone-y option, I'd recommend The Body Shop Tea Tree Pore Minimiser which I opted for originally for the 'tea tree' element when my skin was feeling a little ag-ged off... it's almost like my skin has it's own time of the month all by itself. 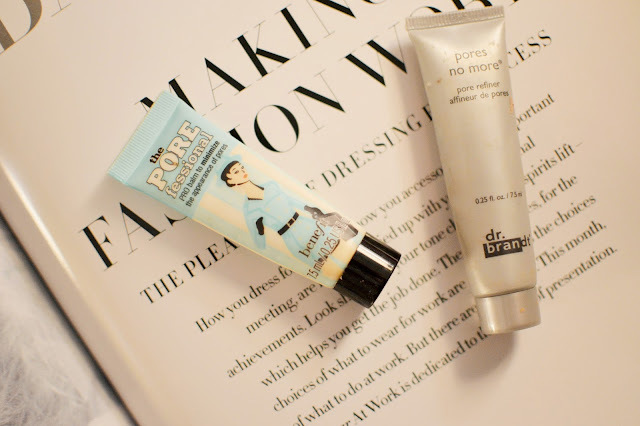 But ladies - if you're going to buy a Pore Minimiser, I'll be honest the Benefit Porefessional is your gal. She'll have you covered in all areas and hey, if you've got an uber glittery eyeshadow, don't have a eyeshadow creme or primer at hand, whack this on under neath. It'll go on way smoother, not tug on the skin and you'll have an even base. Bingo. What is your primer of choice? Tried any of these?